This is a special home tour for me! 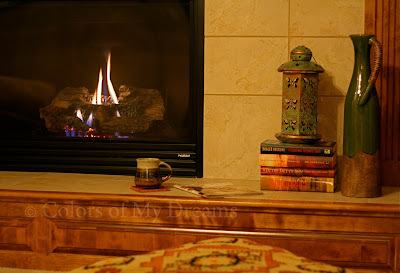 Erum Kazmi's home in Omaha is a dream come true:-) I am both honored and delighted to feature this fabulous home on "My Dream Canvas". 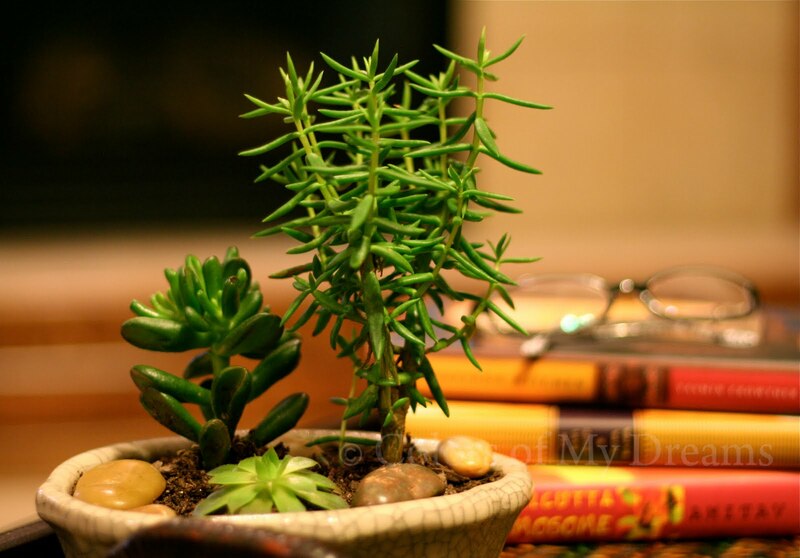 Erum has sent me lovely pictures of the different corners of her home. I asked Erum to describe her home and her style. Her words are just as beautiful as her home. 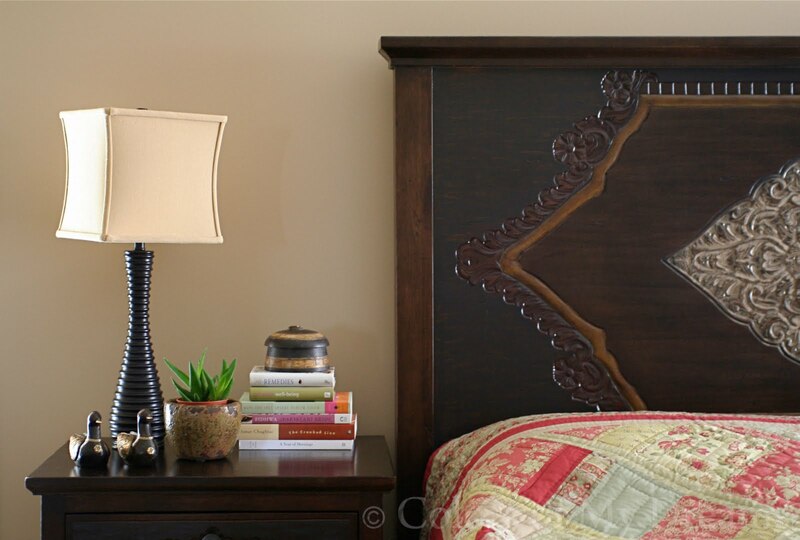 Erum says, "we are all about old-world charm....which makes us traditional to the core. 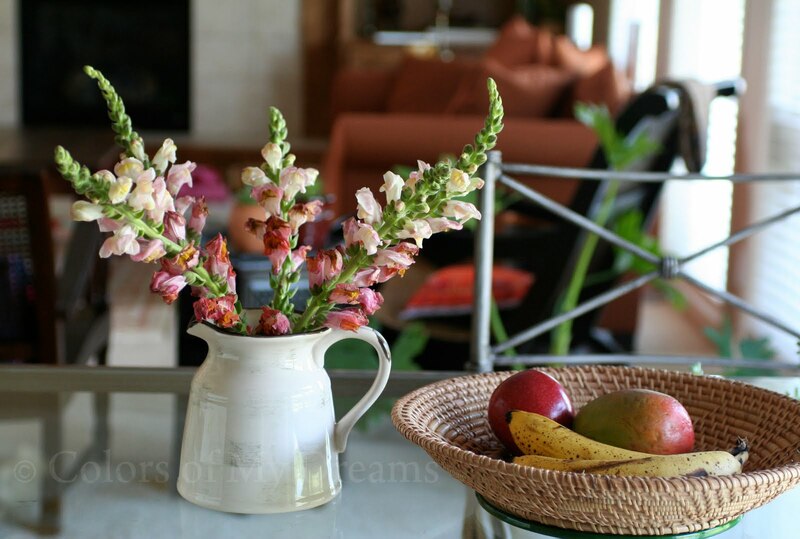 Burnished rustic tones, vivid yellows and greens shine in our house. Life is very blithesome here. There is nothing startling about our modest home. It brims with our personalities and eclectic taste. For us, it's a family haven that feels warm all year long. Most of the ethnic decor pieces you see are from back home or family heirlooms. 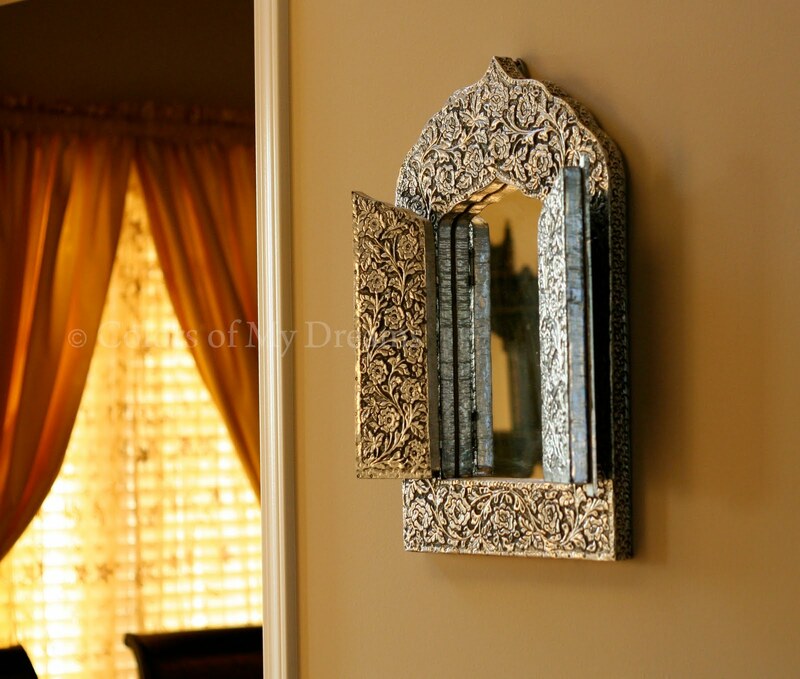 You'll find a lot of jharookas (mirrors) in my house. I love collecting them. They all are from Pakistan...my mother's gifts :) My Nani-jan's (Grandmother's) khaasdan adorns the formal living room. 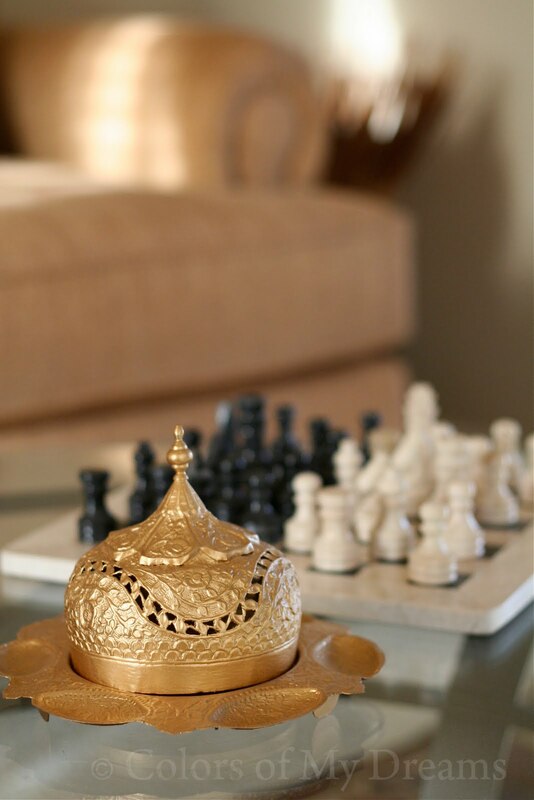 The chess board belongs to one of my uncles. It was in a very dull condition...I got it polished before bringing it here. The little antique jewelery box sitting on my nightstand is originally from Lahore, Pakistan. 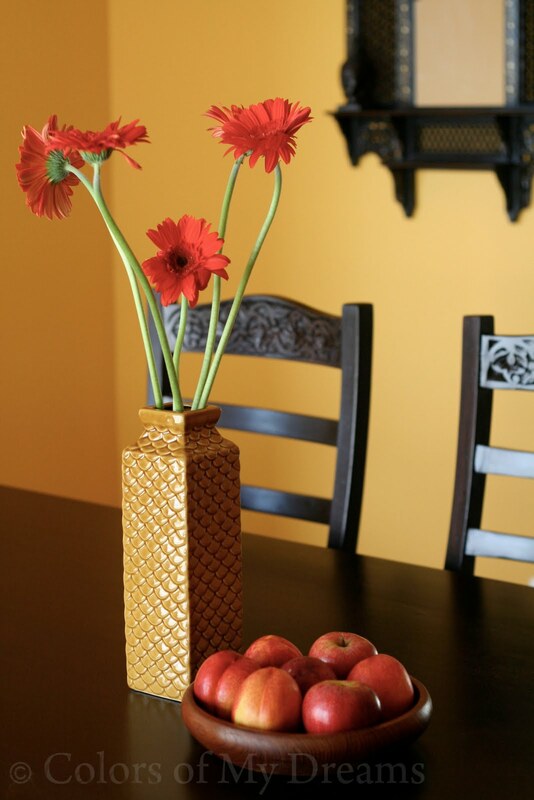 I get the most amazing sunlight in my dining room, so I painted it sparkling yellow." Erum reminds me so much of myself. I too share her passion for family heirlooms and guard them with my life. Every trip to India, I look through old stuff and antiques that go back a few generations. I try and bring back as many as I can :-) My prized collection includes silverware dating back nearly a century, and cut and etched glasses bought by my great grandfather in the 1920's!! I do hope you have enjoyed visiting Erum Kazmi's home. 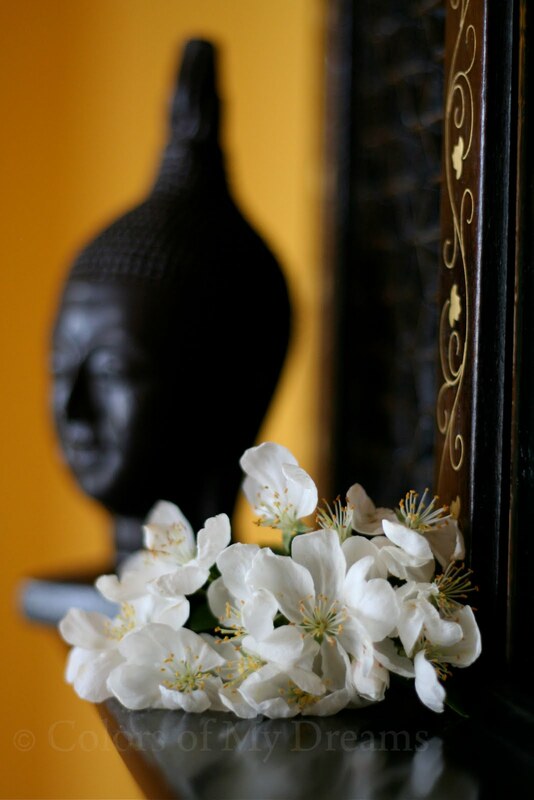 She is a lady with elegance and beauty and this is reflected in every corner of her home. Last, but certainly not the least, is this delightful nursery for her baby girl. Erum says, "My daughter's room is the happiest place in the whole house. I was not sure about the vertical stripes initially, but they turned out so much fun. 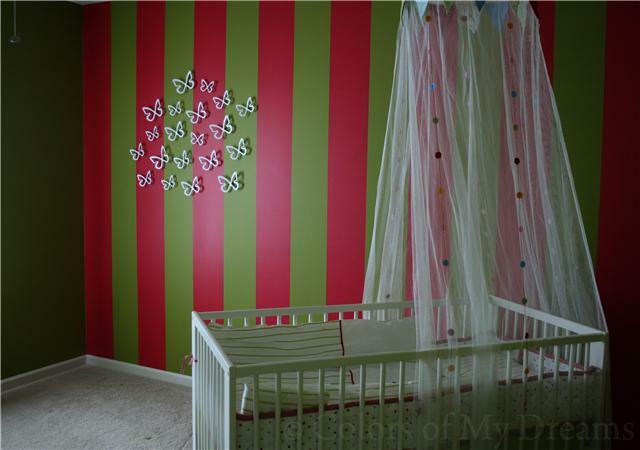 Erum's husband painted the gorgeous vertical stripes in their daughter's room.....impressive, isn't it ?? Anu..one word..WOW! What an absolutely beautiful home! 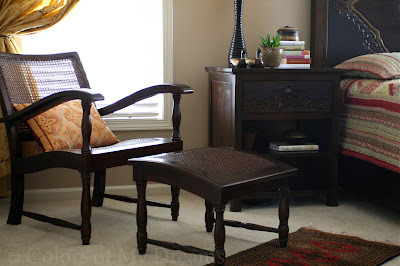 Love that chair, yes as well as the paints used in the home. So warm and cozy! And the lovley Indian furniture pieces! Lovely home Erum, and great post Anu! What warmth and old-world charm! 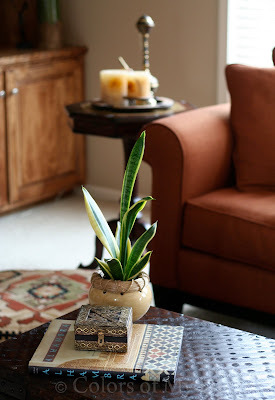 wow...ya..u just got to fall in love...so nice :) inspiring interior pics from her home..
Omg, this is such a fabulous home...I loved each and every pic, thanks for sharing Anu. Fabulous!! I love the mirror, the color scheme & the Brass artifacts! Very elegant. Gorgeous home Erum! This was such a lovely post, Anu. Thanks for sharing. Really love that large urn with the twigs and her little sitar/tanpura (??). 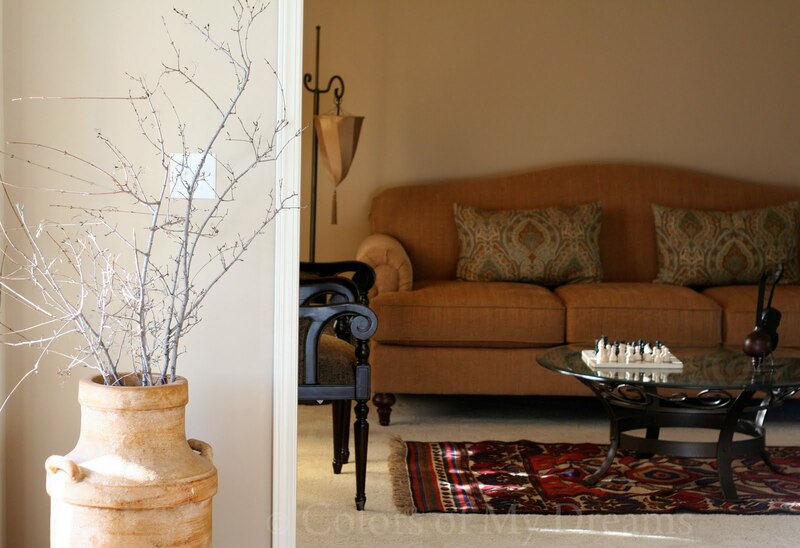 Very tastefully done up home! 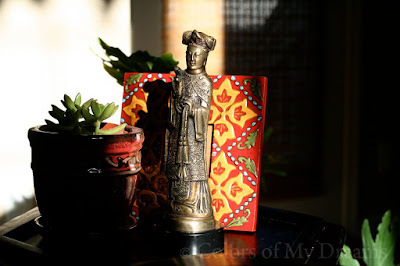 Loved the Indianess...the home is lovely Anu...thanks for bringing us the images.And that burst of color behind the Buddha - what a gorgeous tile! So thrilled to see Nahal's home tour. 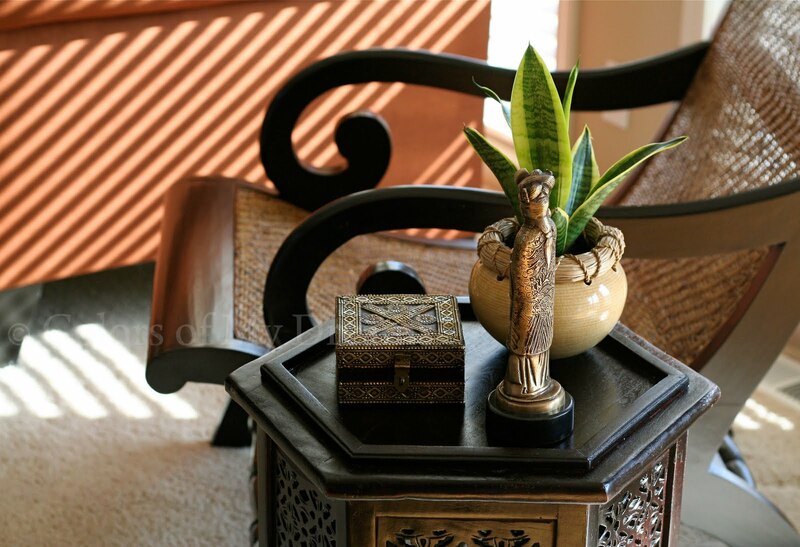 What a cultured and elegant home you have created Nahal. 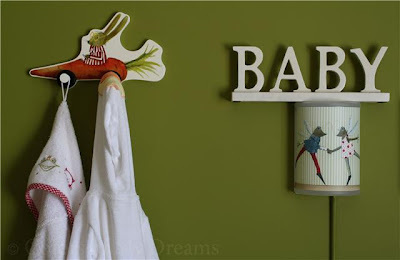 I love that you have incorporated some modern touches like bright painted walls, but otherwise kept to your core style. I just love the decor especially the fireplace pic because of the ceramics ! The baby's room is for the luckiest little girl in the world :) . It is one of the most beautiful nurseries I have ever seen. A great home , Erum and a great post, Anu :)! A great post Anu ! This is beautiful home! I love everything in there. That chair and the stool is stunning! Hiya -- thanks for stopping by my blog and saying hi. Yours is a delight and would be perfect addition to our Friday Finding Beauty post. Stop by and join us. Thank you so much everyone for all the lovely comments. It meant a lot to me. GB - During spring cleaning this year my husband snipped off some branches from the trees in my backyard. They had been soaking in rain and shine for so many days until I noticed one day and brought them inside. The large urn(mexican pottery) has been purchased from a local home and garden show. Oh my... what a lovely home.. Such an awesome blend of old world and modern charm.. Lovely... lovely!!! 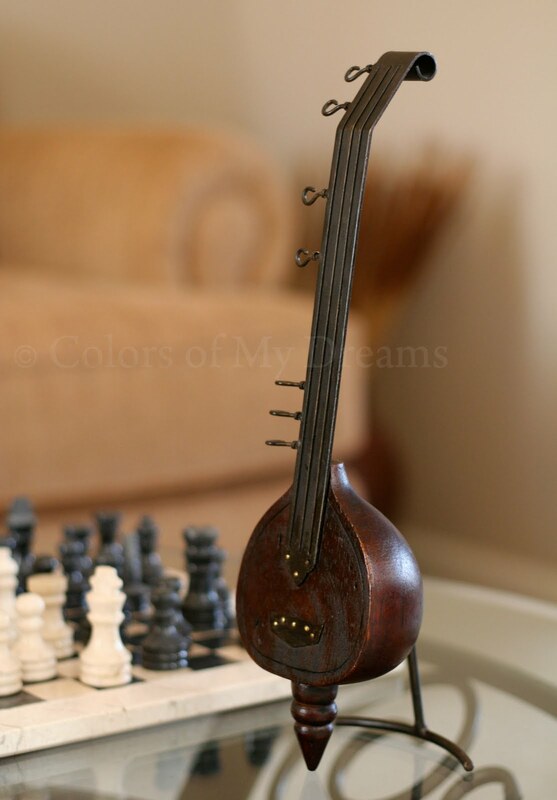 I love the little musical instrument... Oh.. I have to come back and check all the pics again.. Such eye candy!! Lovely post Anu... Well done! Nahal is featured at last! I have always loved her style at home, truly inspiring. Great pictures Nahal. Love the sense of warmth your pictures give!